Based upon research with the Commonwealth War Graves Commission website, the Tewkesbury Register and the artefacts provided by families of the victims, the book intends to write a short biography of each service-man and woman who lost their lives in this war. It also salutes those who were left behind. Tewkesbury Historical Society is disappointed that the governmental approach to this commemoration has been too low key. This has led to fragmented and uncoordinated events, which have involved the ex-service personnel rather than the heirs and beneficiaries of the sacrifice of this valiant yet ordinary generation. We feel that this 60th Anniversary would have been the best time to involve all generations because at the 75th Anniversary the years will have taken their toll, even if “age has not wearied them”. 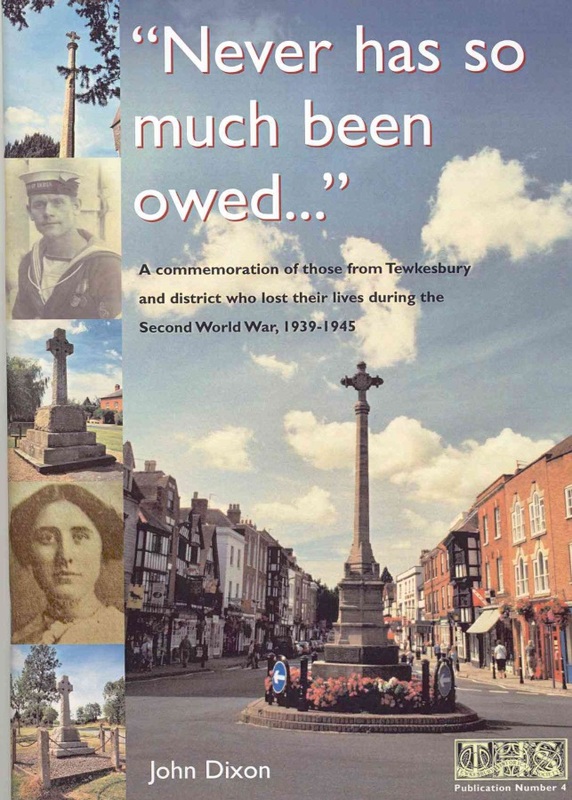 Those in Tewkesbury whose deaths were not commemorated on the War Memorial. Those who suffered on the Arctic Convoys who have not been awarded an official campaign medal. We rejoice at the magnificent statue to the 'Few' of the Battle of Britain unveiled as this book was being completed. We would like to see a commemoration of the work of Bomber Command. Very few local men seemed to have taken part in 1940 battles but most of those killed in the RAF were from Bomber Command. They did not choose to fight such a controversial campaign – they did 'their bit' when called like everyone else. In addition, we should remember the terrible and unwarranted suffering of those who suffered the misfortune of being Japanese Prisoners of War – or slave labourers. I feel that their plight has never been sufficiently understood by governments and people – who feel that they remain the so-called 'Forgotten Army'. Perhaps holding the commemorations in July was an attempt to include them; we could have done much better. In publishing this book, the Society hopes to thank all those who served in any way in World War II. Never was so much owed … by so many to a few hundred local service people and their dependents: men, women and children.